I might just need a hug… – Stones, and Tokens, and Hearts, Oh My! 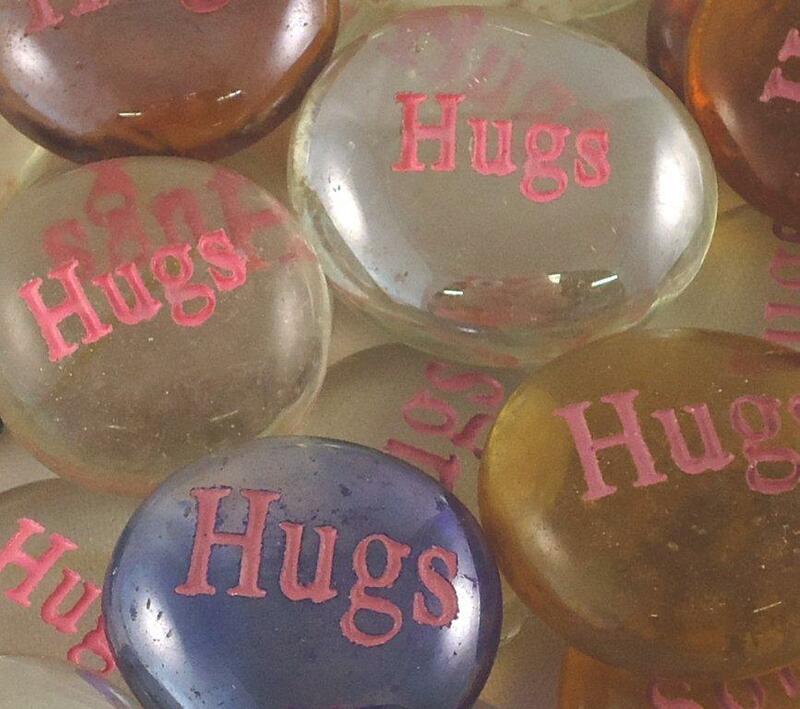 We sell the word ‘Hugs’ in our glass engraved spirit stone line. The word has been offered for a while now, and when we first carried it we sold them with pink ink instead of our standard black or gold. It was the only stone we sold in pink ink – the color just seemed to fit the sentiment and the stones were very popular. Ultimately, however, we decided to switch the ‘Hugs’ back to the standard ink colors to give the whole line a more uniform feel. Recently a customer called and asked if we had any ‘Hugs’ left with pink ink. She needed 5, but specifically only in clear glass with pink ink. We had just gotten in a new shipment of stones, but I was pretty sure we had a few pink ones left on the very bottom of the bin. I told the customer I would look for the stones, but couldn’t make any promises. Trust me, unloading and sorting through 2000+ stones is not a daily occurrence around here, but I was sure there were some pink ones, and for whatever reason felt compelled to dig. After pulling out all the stones, out came 7 clear stones with pink ink! I called the customer and told her what I had found. She was thrilled and said she’d take all 7. Woo hoo…what a salesperson I am! And while the sale wasn’t huge, she sounded so happy it was definitely worth the effort. She then went on to explain to me why the stones were so important. Having just lost her husband to cancer, she attended a meeting at the hospice for grieving spouses. At the end of the meeting, the counselor had set out a bowl of our glass engraved spirit stones, so that each attendee could pick a stone to take with them. Most of the stones were dark in color and as she looked through the bowl, none of the words seemed right for her. She initially chose a blue stone with the word ‘Remember’ on it, and was getting ready to walk away when she swirled the bowl of stones one last time. This time she saw some pink ink peeking out from the bottom of the bowl. She pulled it out to reveal the ‘Hugs’ stone and started to cry. She explained that she had gotten in the habit of talking out loud to her husband, knowing he could hear her wherever he was. Just the day before the meeting, she had said to him “I wish I could have just one more hug from you.” Finding the ‘Hugs’ stone made her feel that he was watching over her. She immediately felt compelled to figure out where the counselor had gotten the stones and to buy some for her children as a remembrance of their father. Hearing her story gave me chills and everyone I’ve told feels the same way. I am so glad I took the time and little bit of extra effort to look through the stones and find those hugs for her. I interact with our products everyday and continue to be astonished by all the different ways each item can touch someone’s life. Reblogged this on Stones, and Tokens, and Hearts, Oh My!.